"Historic Garden Week in Virginia" is presented locally by the Essex County Garden Club of the Middle Peninsula. 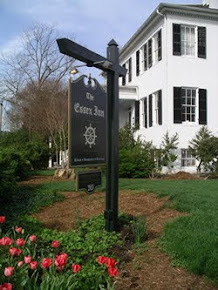 Tappahannock's Open House and Garden Tour is on Friday, April 22nd, 2011 from 10:00am to 5:00pm. We are proud to have been invited to participate in this state-wide and prestigious event. Attendees will be invited to explore both our gardens as well as the interior of our beautiful inn. Only the four suites in our "Quarters" will be available to book for this special event as the main house will be decked out with georgous floral arrangements and made ready for the tour. We will offer a glorified continental breakfast for our guests that morning in the garden (weather permitting). There are five other homes in Tappahannock that are also on the tour so, give us a call or go on-line and book one of the few remaining suites for a truly memorable visit to Tappahannock and The Essex Inn.